Another trip to the Scottish Highlands is always a pleasure for me. 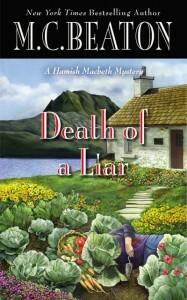 Hamish MacBeth is an old friend and so are his weird neighbors. Death of a Liar is the 30th book in this series so I know them pretty well. Hamish is going about his usual business when a new couple moves into town. The residents of Lochdubh don't expect newcomers to last long in the Highlands but they don't expect them to end up murdered in their yard. As that investigation is proceeding, with all the usual interference from Detective Blaine, a known liar in the next town is found murdered in her garden. MacBeth assumes the murders are related but no one else does so he goes to work on it. Hamish does some solid police work in this book. In the end, you'll see who the murderer is before it's revealed but there are plenty of interesting plot turns and twists along the way. I've read some reviews that say this series is more about the characters and less about the mysteries. I don't know. The characters are always integral to the mysteries and to the atmosphere of a very insulated society. The atmosphere of the Highlands comes through strongly. If you haven't read the others in the series, I wouldn't start with this one. I'd go back to the beginning because Hamish does have a lot of history by now. His inability to have a lasting relationship with women is well established and many of these women float through this book. A lot of that history is talked about. For me, it's discussing well-known history but if you hadn't read the others, it might be a little distracting. I love Hamish MacBeth and Lockdubh. I'll keep reading about them as long as M.C. Beaton keeps writing about them. I was thrilled to win this book through Goodreads First Reads program and I appreciated the opportunity to give my honest review.